Stoke Ferry01553 763044work VillageStoke Ferry lies on the edge of the Fens, about 7 miles south-east of Downham Market. The village lies close to the River Wissey which has also been known as the River Stoke. South east of the village, the River Wissey connect with the Cut off Channel, both of which connect with the River Great Ouse. The village has a long history, and was certainly well established by the time of the Norman Conquest, its population, land ownership and productive resources being extensively detailed in the Domesday Book of 1086. Stoke Ferry village centre is known as The Hill. On it, opposite the church, is The Hall, a plain but imposing three storey brick house of 1792, now converted to offices. All Saint's Church is no longer used for Church services, the last occasion being in 2002 before being deconsecrated and sold to a resident of the village. All Saints Church at nearby Wretton now serves as the parish church for Stoke Ferry. The village offers a post office, fish and chip shop and some other traditional village shops including a thriving Blacksmith's shop that has been trading over 100 years. There are two public houses in the village, The Blue Bell and The Millers Arms. 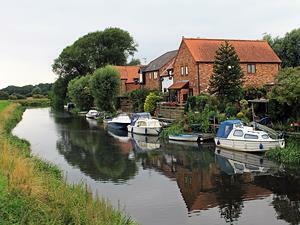 Stoke Ferry lies on the edge of the Fens, about 7 miles south-east of Downham Market. The village lies close to the River Wissey which has also been known as the River Stoke. South east of the village, the River Wissey connect with the Cut off Channel, both of which connect with the River Great Ouse. The village has a long history, and was certainly well established by the time of the Norman Conquest, its population, land ownership and productive resources being extensively detailed in the Domesday Book of 1086.